In the upcoming years the trend of a stronger urbanization will take place world wide. That will lead to different social, environmental and economical issues and will also increase the pressure on cities. Another circumstance was that the progress of the globalisation has deepen its impacts also on the scale of local politics. Cities got more and more in direct competition in contesting for well educated professionals and investment. The downside in many cases is that city politics are losing its focus on user groups which are representing the majority of the local inhabitants. One of these problems are most vivid in the “booming” concept of a “smart city“. There is no coherent definition existing but most of them which are so far published are mainly based on the idea that technology will be the important tool for dealing with problems like climate change and the stronger migration from the country side to urban areas. The problem within these “smart concepts” is that they are neglecting educational and social aspects. Instead of this there is a strong bias to work only with technological solutions for creating a smart urban community. One of the positive exceptions in these smart city discourse is the example of the City of Vienna, which is also the capital of Austria. © Vienna City Administration / http://www.smartcitywien.at. For giving our readers a deeper insight behind the main ideas of this smart strategy we had the chance for having an interview with DI Thomas Madreiter, Director of Urban Planning in the City of Vienna. Urbalize: What was the driving force for the City of Vienna in working on its „smart city“ concept? The driving force from the very beginning was Mayor Dr. Michael Häupl, who initiated the first actions towards Smart City Wien in 2011. But there Vienna has already been working on these issues for many years, already before “smart cities” were established. It has always been a city of particular programmes, measures and more subject specific oriented plans. The first step of the Smart City Wien initiative aimed at surveying the existing capacities, programmes, projects and services. Successfully implemented umbrella programmes and the guidelines for sustainable construction site management formed a constructive starting point for the work of the Smart City Wien project. Climate and energy programmes such as the EU’s Strategic Energy Technology (SET) Plan, a funding programme for European high-tech, represented another aspect. In the second step of Smart City Wien, the charter documents for the coming years and decades were prepared. An essential component here is the fact, that they were coordinated together with public and private stakeholders from the beginning. These efforts were based on the current forecasts for Vienna’s demographic development, which predict a rapidly growing city on its way to becoming a metropolis with a population of two million people. Urbalize: Which methodology were used in creating the „smart city“ concept? A wide stakeholder process has to be mentioned as a milestone for the Smart City Wien initiative. Its objective was to prepare all people and relevant stakeholders from public and private entities, the city administration, research institutions and business sectors for the challenges of the future. Institutionally the Smart City Wien course of actions is imbedded in especially established working groups within the city administration, supported by a city owned Smart City Wien Agency. This agency, located at TINA Vienna, is the coordinating institution for all the stakeholders within the Smart City Wien initiative. It supports the efforts of the city to reach its goals and to ensure a successful transformation and offers a common platform. This includes a specific focus on research and technology policy in the city, as well as the active involvement of its residents, local industry, research and Viennese businesses in the Smart City Wien process. Urbalize: Participatory engagement is one of the key elements in the concept. But how will it be possible to reach enough critical attention and embedding local users? In order to promote a firm cooperation of the citizens it is important to sensitise them for Smart City Wien. Building awareness is an important task in this regard. The City of Vienna has informed the citizens about the central topics such as renewable energies, protection of resources and sustainable mobility with a widespread publicity campaign. Hereby, the direct advantages for each individual citizen play a central role. Citizens must be able to understand the innovations and technologies in order to be able to use them in their daily lives. It’s about communicating that the protection of resources is not a sacrifice, but an opportunity. Urbalize: In such a process the participation of local stakeholders is rather important for its success. In what manner was this possible and how were those stakeholders selected to become part of it? In the beginning in 2011 the key element of the initiative was a stakeholder process in which all stakeholders inside and outside the city administration were asked to participate in either general consultation teams or teams focusing on specific issues. The six themes addressed by the platform were population development, environment, administration, economy, energy and mobility. Three forums provided the backbone: in a first step the broadly defined stakeholder process mapped out the “Smart Energy Vision 2050″ as a long-term vision for the city’s energy future. Out of these forums, the so called “Smart City Wien Stakeholderforums” were established and are upheld twice a year. Each forum is focusing on one specific theme with stakeholders and experts from the respective field. The stakeholders are chosen from inside and outside the city administration like: established businesses, start-ups, architects, consultancies, city owned companies, industrial companies and many more. The results from these day long forums, with 120-150 stakeholders, are integrated in the internal working groups. Urbalize: In existing “smart city” concepts very often the key element is technology. 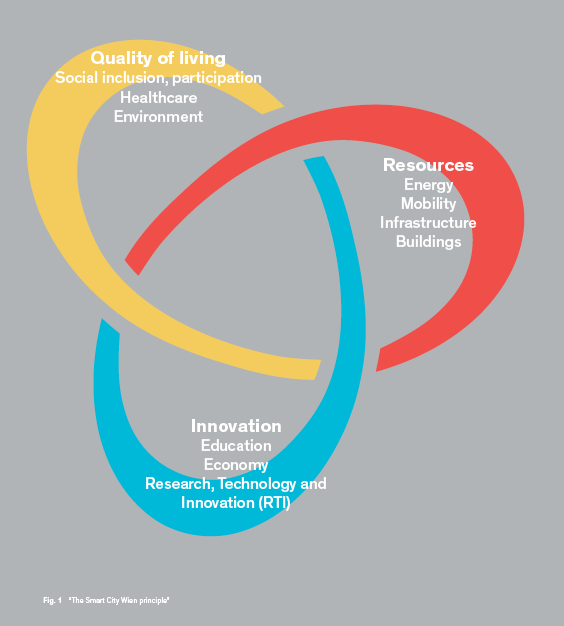 Why has Vienna, chosen to work with three dimensions (resources, innovation, quality of living) instead of only one? There can’t be one worldwide accepted definition of a “Smart City”. The defined term has to be based on the particular specific local conditions. Vienna has, in awareness and acceptance of the global challenges, found its specific definition, based on its regional challenges and circumstances. Smart City Wien uses a holistic approach focusing on energy (-systems), mobility, buildings and infrastructure resulting in radical protection of resources, a high socially fair quality of life and productive use of new technology. That’s why we chose these three elements of resources, quality of living and innovation as our basic dimensions, always considering the social inclusion as important for the three of them. Technology is of course always the supporting element. Urbalize: Concerning technological innovations in the future, are there any adaptions in the agreed road map possible and if so in which time frame could that take place? One of the main pillars of the Smart City Wien Framework Strategy is innovation, which includes Research, Technology and Economy. Research in combination with showcase projects can encourage the transformation process until 2050. The key behind every successful strategy is a combination of a top-down and a bottom-up approach, where new technological innovations can be implemented under the umbrella of Smart City Wien. The Smart City Wien Framework Strategy was created to put up this umbrella. Urbalize: The human resource management of the public administration got also its attention in the “smart city” concept. Why and what are the possible gains for having a goal on that issue? Smart City is a cross cutting issue, that’s why the City of Vienna is using a very holistic approach. Therefore, the city administration with its different departments needs to work cross-departmental on the different challenges. It is very important that the staff is also trained this way. The City of Vienna is in close cooperation with universities on this way of thinking about modern human resource management. Because of that for example trainees of the city administration need to work in different divisions, to learn how to work inter-departmental. Urbalize: Working and educational conditions (e.g. working law, enrollment conditions for higher education) are essential for a prosper future of an urban region. How will Vienna try to implement its visions on this field which are at the moment mandatory hold by national legislation? The City of Vienna is guiding master thesis and diploma thesis on Smart City related themes. Beyond that, the Wiener Stadtwerke Holding AG (Vienna Public Utilities Company) and the Vienna University of Technology have together instituted a Doctorate Course entitled “Urban Energy and Mobility Systems” (URBEM-DK). The goal is the research and development of scenarios for the path to a “smart, sustainable, supply-secure, affordable and liveable city”, using the example of the City of Vienna with an integrated and inter-disciplinary approach. On another level, we’re in cooperation with different educational institutions to implement Smart City related content in the classroom. Urbalize: What certain actions will take place within the next 2 years? The different sectoral strategies like the SEP (Energy efficiency plan), Digital Agenda (ICT strategy) or the Innovatives Wien 2020 (R&D strategy), will be developed within the next two years. These strategies will always be acquired concurrent with the vision and goals of the Smart City Wien framework strategy. Additionally a number of realization activities in the fields of buildings, energy and mobility will be launched. Urbalize: If Vienna wants to promote its “smart city” vision, how will that be established in the near future? There is a close cooperation on that topic with the city’s department for Press and Information Services to promote the Smart City Wien initiative with its vision, goals and projects. We’re taking a broad range of actions with Smart City Wien related content like events, exhibitions, magazines or social media. Giving citizens (from consumers to prosumers) an active role by providing opportunities for actively controlling additional areas of daily life is here an important task. To inform citizens about their possibilities can create a new thinking when it comes to behavior. This is essential if we want to reach our goals within the Smart City Wien Framework Strategy. For example, to reduce the individual motorized transport.